Bethesda have thrown their full, mighty, money-laden weight behind modding for Fallout 4, and we’re starting to see the fruits of that now. With the beginning of the open beta for mod tools on PC, the full ecosystem has been launched that allows for players to create and share ever-more revealing armour sets and guns that fire farts easier and quicker. You can access it now via the beta menu on Steam, and Bethesda have launched an official wiki for information and tutorials, as well as their own workshop page to let you browse and download, hosted on Bethesda.net. 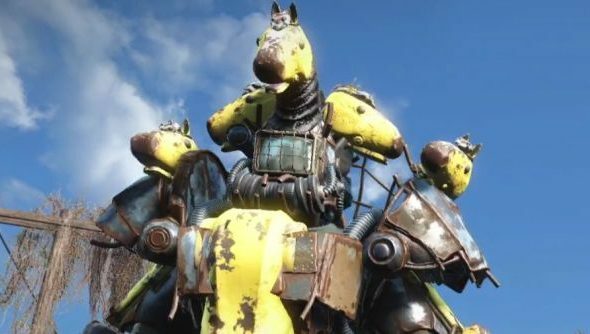 Here’s the very best Fallout 4 mods so far – expect much expansion in the future. Everything that’s been uploaded so far is listed on the Bethesda.net Workshop, including the rather fab Fallout 4 Unofficial Patch that digs out a few more bugs Bethesda haven’t managed to kill off. Also proving popular are this custom radio station and a mod to improve settlement management. To browse all this in-game and get them plugged in, you’ll need the 1.5 update from Steam, which you get byright clicking on Fallout 4, then going to properties, betas and select the option from the drop down. Either wait a couple of minutes or restart Steam and it should download. Meanwhile, if you want to get into creating stuff yourself, you can get the Creation Kit through the Bethesda.net launcher as a free download. There is a Bethesda-backed Wiki, but currently it’s very barebones as everyone’s busy experimenting rather than writing up documentation. If you do create something, it will be available on the consoles once the system launches properly in May and June.